Happy first day of fall! I can’t believe that summer is officially over. I remember waiting for the start of summer so I could be spending my time in New York. Now, my last semester is in full swing and I’m excited for (kind of) cooler weather. Fall is one of my favorite seasons to dress for. This plaid top has been on major repeat ever since I picked it up. I ordered it in a size up so that I could wear it over a tank or on its own tucked into jeans or over leggings. Not only do I love the colors, but it is SO soft. Everyone needs soft plaid for fall, right? I also have been wearing these jeans nonstop. I invest in a good pair of jeans every few months (usually twice a year). These are from my favorite brand and are SO comfortable and flattering. I’m super excited because the website design is underway and it’s looking so good! Can’t wait. Also, I’m going to try to start incorporating more “lifestyle” style posts, if that makes sense. I want to show you how I wear these outfits in everyday life, running errands, going to brunch, etc. So hopefully I can start doing that within the next few weeks (if it ever cools down!). I LOVEEEEE this plaid shirt!! I am such a sucker for plaid and button downs! So ready for Fall weather! Loving that plaid shirt! So perfect for fall and I think I need to add this to my shopping list. Great plaid to ease into the season. Also loving that Prada. Love this look! Flannels are the best for this time of year because you can wear them by themselves or layer them on top of a cute tee as a sweater. You look darling! This is the cutest plaid top I’ve seen this season! Love the colors!! Love that plaid paired with neutrals! What a great look for fall -love the plaid shirt! Loving that plaid for fall!! Such a great pair of jeans! Also love the plaid! 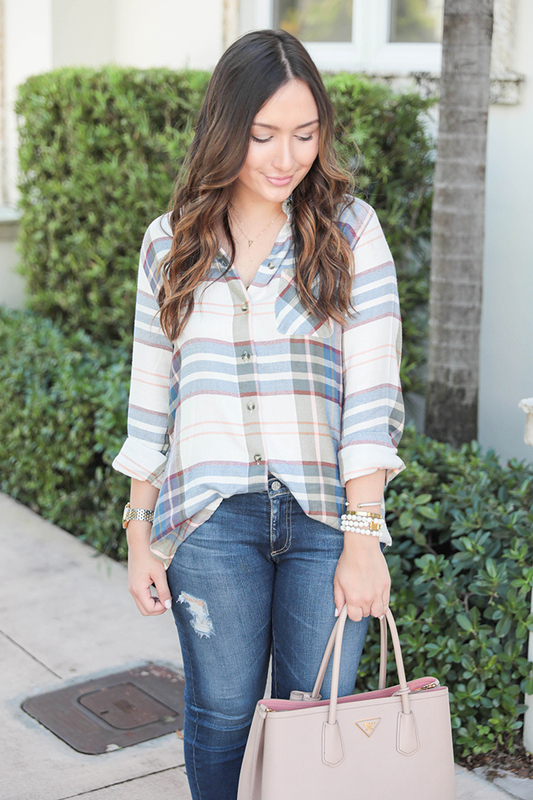 This plaid has been on my to-get list and after seeing you styling it perfectly, I def need it now! Love this look sister! Oh that top is so perfect for fall! I love plaids 🙂 Also that bag – so chic. I love it!